The pictured item is about 5 inches high. Just wanted to let everyone know that the decorative paper swirls are the art of paper quilling. Not really sure, but a lot of those decorative boxes could have numerous uses. Thank you for participating! It's a tea box – made of rolled paper, set so the ends show; dated 1800. It appears to have a coaster beside it. It may be a box for coasters, but why would coasters need to be locked up? Victorian Keepsake box. Souvenirs, dance cards, pressed flowers ect For treasured personal items. 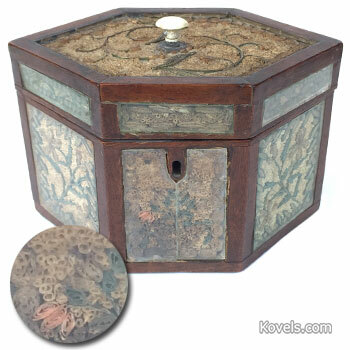 It's a tea caddy with curled paper decoration. Tiny strips of colored paper were rolled up and set into recessed panels to create designs. It's kinda small for a tea caddy so I'll go for a spice box.